the last one did a 55 sec sleeper ! "oeuvre de coeur prend tout un homme"
You seem to have at least two different paper clip top designs, don't you? 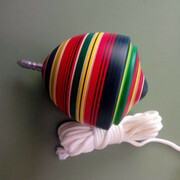 Answering your question, technically that cylindrical thing is a spinning top. I liked the rattling noise it made. PS: I had to watch it two times because the first time I was too distracted by the glasses. Do you have a collection of wacky glasses? I like your metal head friend there Jim. A collection of wacky glasses!!! That is an interesting statement. I have been collecting weird glasses for some time and wanted to make a display of them in my office so kids could come in there and try them on and get some laughs. Could Jim be way ahead of me? Happiness runs in a circular motion! Mean while back at the ranch. This is Tim at work again! He talks about this design by a professor in Japan, Sakai? Then he shows his design with a little magnet. Very clever!!! This is Tim at work again! He talks about this design by a professor in Japan, Sakai? Note at 1:21 how little counterweight it takes to get decent static balance. The residual wobble is due to a combination of couple unbalance and structural flexure. Great paper -- very accessible. You can also find Sakai's original paper online, but it's in Japanese. Alas, the parts needed to make a working 3D LEGO tippe top don't yet exist, but a LEGO version of the author's 2D tippe top might just work. Ha, you always find a way to Legolize them! I have little choice in this. It's apparently my calling. Anyone had tried the Tippie top (fig 3) mentioned in the paper?? I would love to see a video! ...the last one did a 55 sec sleeper ! Never tire of watching tops that behave like that gas cartridge! I call them "gyrophonic" for the whirring sounds they make -- especially on a resonant surface. (1) Large center of mass (CM) to contact distance relative to top's maximum diameter. (2) Large TMI/AMI ratio, where TMI = transverse moment of inertia about the tip, and AMI = axial moment of inertia (about spin axis). (3) Ball tip or equivalent (as in your gas cartridge). The ball tip (3) is essential -- and within limits, the larger radius of curvature, the better. Properties (1) and (2) generally go hand-in-hand, but not always.